- Premium Tuner Tongs - These High Quality Turner Tongs with 100% FDA grade BPA free silicone tips provide greater safety and protect you against contaminating foods. 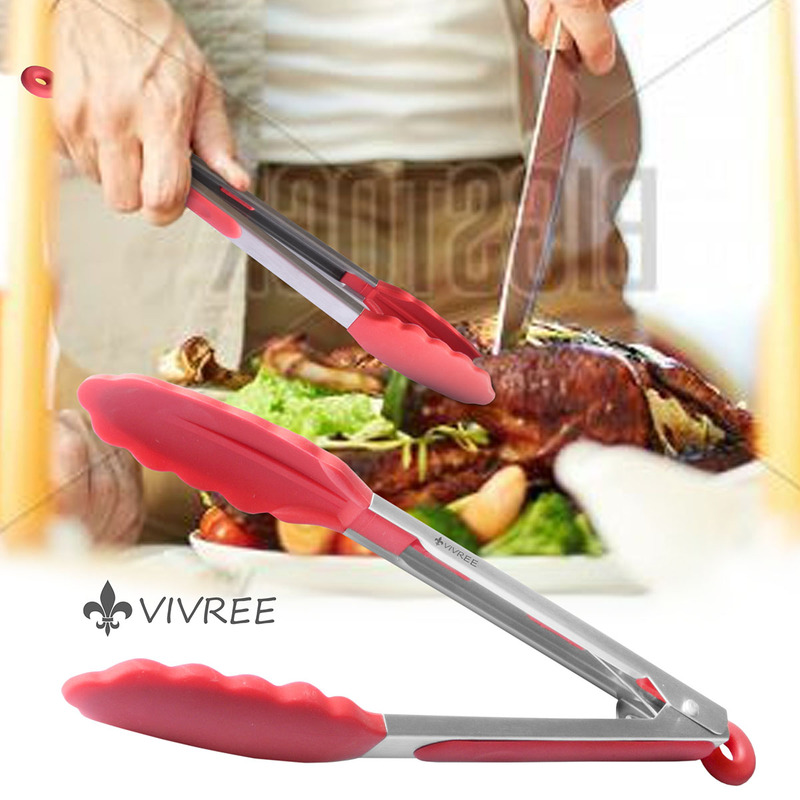 Ideal Kitchen Tongs for a variety of foods, including serving and cooking foods such as salad, grilled foods, pastas, fruits and much more. 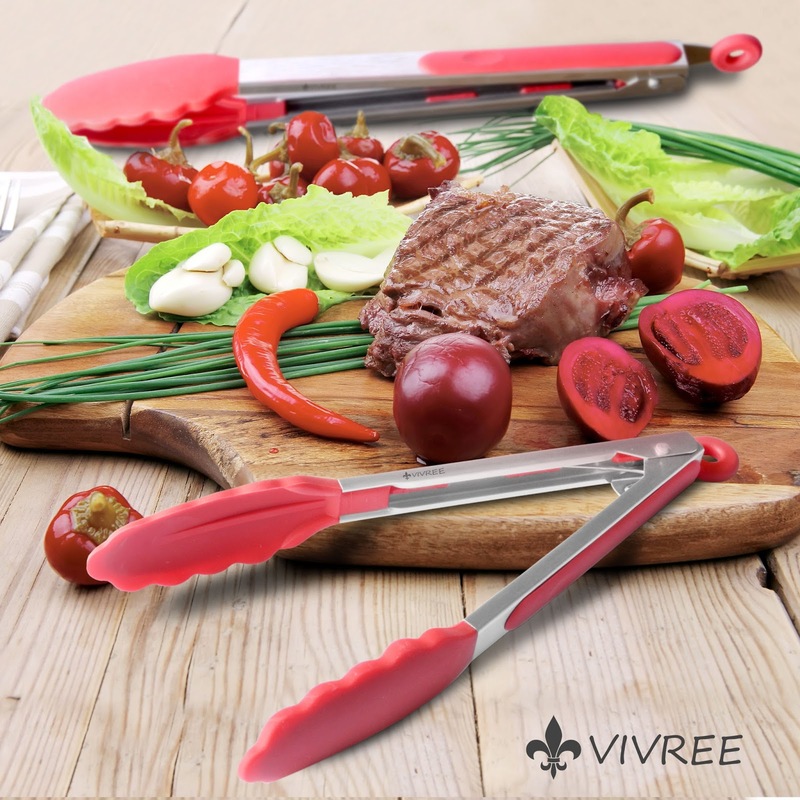 Vivree Kitchen Tongs Set - Salad and Grill Stainless Steel Serving Tongs with Silicone Tips have heat-resistant silicone heads that won't scratch nonstick cookware. An innovative automatic locking mechanism allows for easy one-handed use. 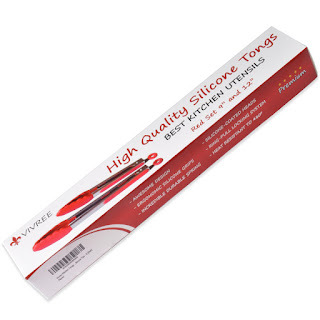 Crafted of heavy-gauge stainless steel with silicone tips and silicone grips - 1-1/2 inches wide with scalloped edges, these provide a firmer grip so you don't drop anything, making them essential for anything that can't be easily removed from a pot, pan or the grill with either a spatula or spoon. Heat resistant to 480°F so they won't melt or char as you cook. This means your food will always be free from plastic smell or taste from your turner tongs. Scalloped heads handle foods delicately without piercing them. Firm spring action provides exceptional control, so you can pick up one pea or flip a 2-lb. Steak. Perfect for pots and pans that are Non-Stick coated, which means being very careful when using metal tongs as you don't want to scratch the surface. 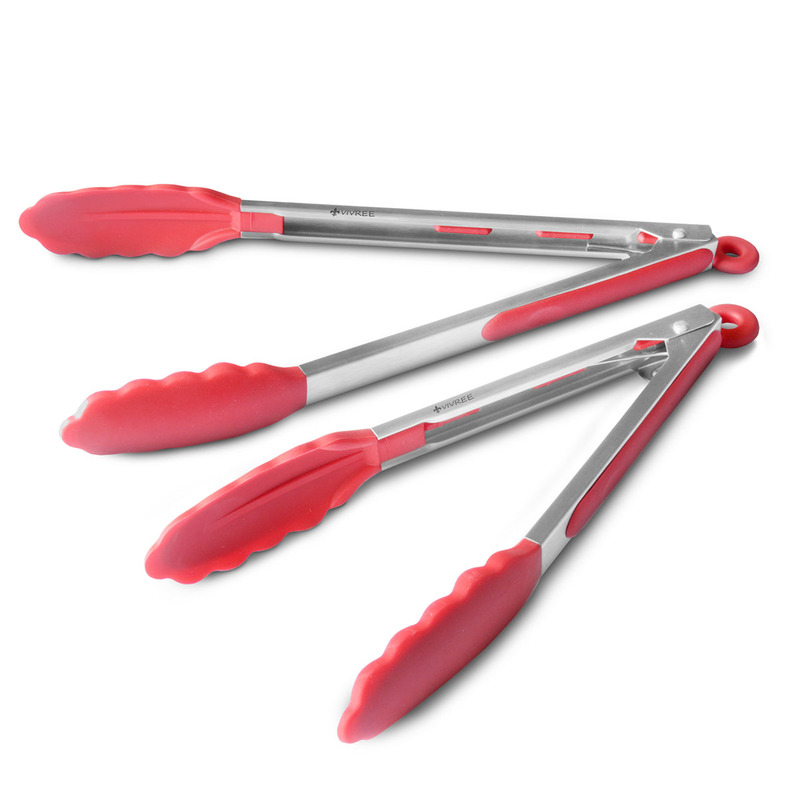 These tongs have a grip-able surface and they don't slip out of your hand even if they are greasy. Locking handles for compact storage - Automatic lock opens when you point the tongs down and give them a little squeeze, and closes when they're pointed up so they're easy to handle ans store in your drawer or hanging on the wall. "Dishwasher safe" makes clean-up much easier. I was very happy to get to try this Kitchen Tong Set by Vivree. I have a red themed, stainless steel kitchen so the color fits in just perfectly. What I like best about these kitchen tongs is the size. I like that they are smaller and much easier to handle than the very large tongs I already have. I like that these tongs fit nicely in my hand I have control over them. This is important to me because I use them to get corn on the cob out of boiling water and I use them to turn foods on the bbq grill outdoors. Now I have no fear of dropping the hot items back into the boiling water or losing a hot dog to the bbq pit! I like that hey have a hole in the handle so they can be easily hung up in the kitchen for easy access. The silicone tips are nice because I have protective coating on all my cookware. I also like that there is a silicone grip on the handles that stays cool. I also like that the tongs come in 2 sizes and can be locked for more compact storage. I find them easy to clean and easy to use. I recommend them!